This August I’m sewing along with Tasia at Sewaholic.net. A bunch of other talented seamsters and I are all making her just-released Lonsdale dress, which happens to also be a summer essential – happy day! Here’s a reflection on my efforts to sew well. The Lonsdale Sew-Along is speeding along. This post will likely be my only progress post as the dress will be finished in a matter of days. After a happy weekend filled with a little bit of sewing, I caught up to Tasia’s most recent Sew-Along post. The sewing was quick and easy, even with the few changes that I made. I took a bit of a detour by adding spiral steel boning to support the back of the dress. When I made up the muslin, I decided I liked the bodice best as a halter. I knew the ties were important for supporting the back of the dress and omitting them meant that I needed to find another means of support. I learned how to add boning to a bodice while watching the videos for Gertie’s online class, and I felt that this technique was a perfect solution. Although Gertie recommended sewing in pre-made, store-bought boning channels or making channels from satin ribbon or silk organza, I ended up making them out of strips of the fashion fabric as I didn’t have any of the other on hand. Susan Khalje recommends cotton bastiste or something similar in her shop. Here’s to hoping that my cotton falls into the “something similar” category and that I never notice any problems. I placed boning channels on both of the side seams and also on both back bodice pieces just posterior to the notches for the loops. 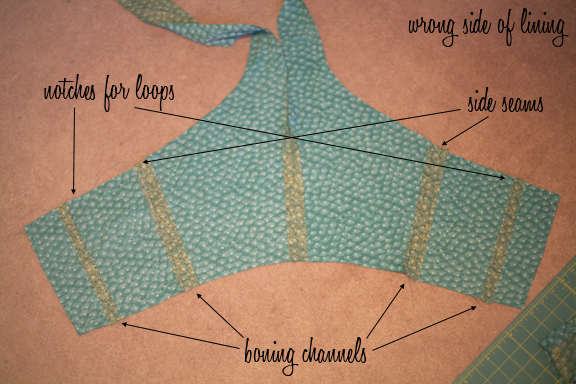 The latter were placed to support the same region of the dress that the straps and loops traditionally offer support. I offset them towards the back center so that they would also be able to support the zipper. Another reason for offsetting this second boning channel was so that I have the option of making the straps convertible. I can imagine adding a small button hidden just inside the lining (just underneath where the loops would have been) and adding small buttonholes to the straps. If the buttonholes are placed correctly, the straps should be able to come straight down the back and also criss-cross across the back if I want. I haven’t worked all of this out yet since I want to see how the dress wears before I start stitching buttonholes all over my straps. As a side note, because I’ve changed the way that the straps tie, I was able to shorten them considerably. I also took a bit of a detour when it came to the waistband. My intentions are to use a coordinating grosgrain ribbon so that there will be a bit of a contrast at the waist. I like all of the images of belted Lonsdale dresses I’ve seen around the internets, and I hope a bit of texture here will give me the same look. Though I haven’t done it yet, I will also be adding a waist stay to the waist to support the boning I’ve added. It seems crazy that we’re almost through sewing this dress. Even with all of my detours, it’s been a speedy process. Straight stitching, no darts. As long as I remember to finish my seams as I go, I imagine the skirt portion will come together just as smoothly. Next Post Lonsdale Sew-Along: Completed! Looking good! I can’t wait to start mine! For your casing did you just fold the fabric in half and sew together on the one side? I actually cut a strip of fabric to use as if it were a silk ribbon, maybe 3/4″ wide. I sewed along each side about 1/8″ to 1/4″ from the edge, leaving a channel just over 1/4″ wide. The back of the channel was the lining (or the lining and seam allowances in the case of the side seam channel). The front of the channel was the single layer of “ribbon” that I’d added. Nothing was stitched to the exterior bodice pieces, so none of this shows from the outside. Would you recommend folding the fabric in half for the casing? Also, you should start your Lonsdale soon. It’s a quick sew, which is always good for the sewing vibes! Goodness I have no suggestion, I was just going to make it look like Gertie’s casing as much as I could and that was just the first idea I had come up with. Now that I watch the lesson again I can tell that it is two pieces of material sewn together so what you did would mimic it the most. I’m thinking of using this fabric for my Lonsdale: Shibuki Dragon” The Alexander Henry Fabrics Collection 2007. I had to have that fabric after seeing this thread on craftster (http://www.craftster.org/forum/index.php?topic=252249.0;topicseen) and it has set in my closet ever since. As an aside, the lining I have for my bombshell has dragons on it. It’s more of a humor piece than fabulous piece like the one you have, but it makes me smile. Ugh lets not even discuss the Bombshell fabric cause I can not commit to anything for more than 5 minutes. Amy – This dress is going to be beautiful. Boning? You’re turning into a pro! And I love the idea of the contrasting waistband in grosgrain ribbon. Well done. Thanks! I’m trying to add new techniques to my sewing, baby step by baby step. Though, the difference between me and a pro… well, it’s a fairly funny comparison! Looking good! I love the grosgrain ribbon! I’m excited to see your finished dress! Thanks! I’m excited to see yours as well. 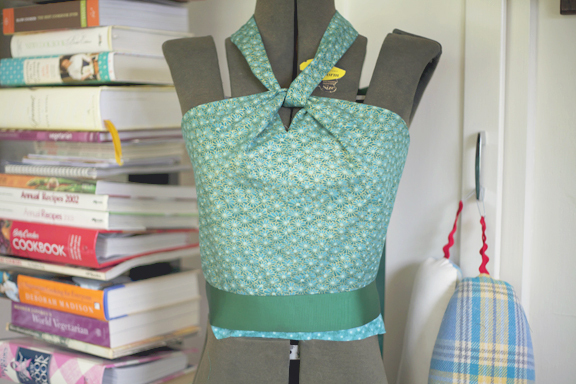 Have you been able to make any progress on all of the dresses you have on your sewing table? A little bit– I’ve got the bodice put together for the Lonsdale and I’m working on facings for the dress I’m doing for Gertie’s class. Haven’t done a thing yet for the Rooibos– I don’t even have fabric! Not sure how that one’s going to work out, although my husband just left for the rest of the week, so I’ll have no reason not to sew every night this week! That’s a good idea on the boning–I’m going to make the normal ties but even with them tying on the back, the back bodice still wants to droop a bit (I’ve now decided to make this out of a very drapey rayon) so I had to tighten the seams in. I see a lot of people using boning now and I am curious about its comfort, which is why I’ve shied away from it before–let us know how it feels! The funny thing is that before buying any spiral steel boning, I went through my closet to see what held up the many ready-to-wear strapless dresses that I have from years of attending weddings. They all had boning in them! So, even though I’d never even thought about the stuff until Gertie’s class, it had been secretly hiding in my clothes. And, it’s actually really soft and pliable. You can bend it in all kinds of directions, and then it’ll pop right back into place – no harm done. In fact, I ended up buying a roll of 10 yards (since I do hope to make the bombshell dress this fall and figured I’d be more likely to get started if I had enough materials on hand), and it came all coiled up – the coil being about a foot in diameter. I don’t think it’ll feel any different than having a zipper in a dress. It’s looking really lovely – the neck tie is very cute! Thanks, it’s a well thought out pattern that seems to be really flattering on everyone I’ve seen. I love what you’ve done- can’t wait for the finale! You’re on fire!! It’s really looking good and I do like the grosgrain and fabric choice. Spiral steel boning – I actually bought some from Susan Khalje online last year – for a rainy day. Hi there! How did you tie the knot in the front of the dress so beautifully? Mine usually comes out lopsided. Any tips? I’m not sure! My fabric is a Japanese cotton, so it’s got a good weight to it. Perhaps that keeps things lined up? Also, I shortened my straps to simply toe behind my neck, though I can’t imagine that affects the front knot.